Sweet and spicy on the nose. Stewed fruits - peaches and oranges - nicely mixed with creamy vanilla and oatcake. Sweet honey and ginger spice in the back. Sweet and fairly warming on the palate. Creamy honey and vanilla nicely mixed with spicy notes of black pepper, nutmeg and subtle oak. Intense with creamy notes of barley in the back. The finish is long and velvety with honey, vanilla and sweet barley sugar. Becomes slightly dry with bitter orange peel and subtle oak. Fresher on the nose when a splash of water is added. Delicate vanilla mixed with citric fruits and creamy honey. On the palate, the spiciness and warmth are significantly tamed. Still sweet with vanilla and honey followed by only a slightly amount of citric fruit and pepper. The finish is medium long with creamy notes of honey and a bit of dry oak in the back. A wonderfully creamy-sweet and intense Highland blended malt with a nice balance of yellow ripe fruits and spicy notes. Water takes away some of the alcoholic warmth but it can be enjoyed neat very well, too. 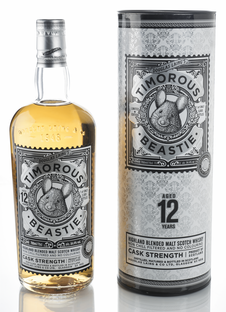 Another excellent and attractive addition to the existing portfolio of Timorous Beastie.